During AMD presentation of their Capsaicin event there was a single theme resounding from everyone who took to their stage – increase in performance. Whether that was from what DirectX 12 and Vulkan could bring to the table to their next generation Radeon architecture, Polaris – it was clear AMD has a vision for the future. 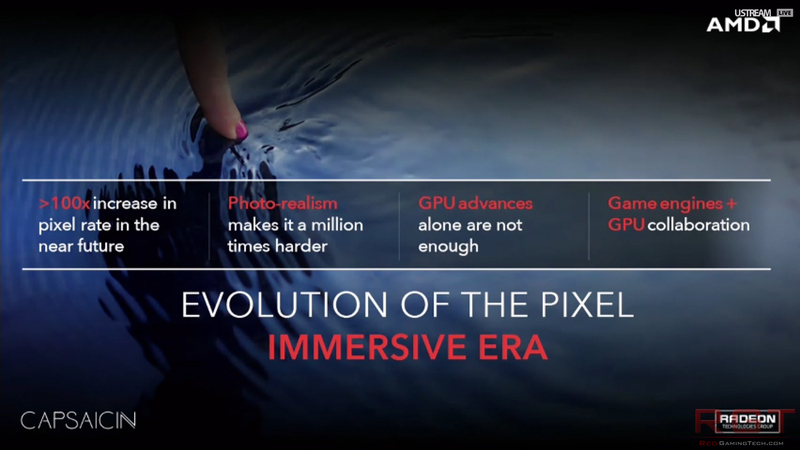 Within a few minutes of their Capsaicin event beginning, Radeon Technology Group chief architect, Raja Koduri took to the stage and began discussing the pursuit of the immersive era of entertainment and devices. 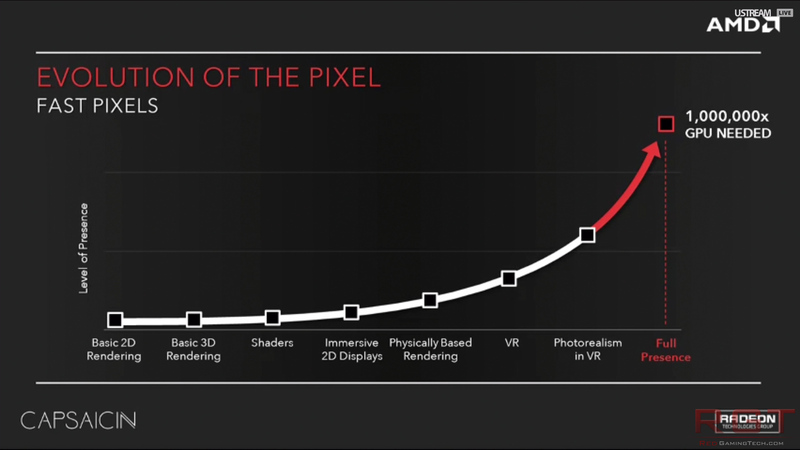 AMD believe this will be achieved with ever more powerful GPU’s combined with the latest game engine technology (more on this in a moment). The company are currently looking to improve the current performance per dollar ratio for gamer’s, and echoed previous statements of lowering the cost of entry for powering Virtual Reality devices. AMD are looking to expand their business, leveraging the benefits of the new 14nm FinFet process to drive down the cost of the next generation Polaris cards. During a session with PC Perspective, Raja Koduri said “What you’ll see us do is completely different with Polaris 10 and 11. We are really focusing on trying to bring FinFET technology with it’s amazing performance per watt to as many segments as possible. As many ranges of performance as possible. I can tell you Ryan, you and your readers, you’ll be pleased at what we’re going to do with this thing and you’ll be surprised. Right now, the mainstream sector is considerably better off than the performance sector in times of performance per dollar – it’s one of the reasons GPU’s such as the GeForce GTX 970 and the Radeon R9 390 are so popular compared to the Fury X’s and the Titan’s. They better track with Moore’s law, and this is something AMD are taking very seriously if the above quote is anything to go by. To help sell the idea of Polaris, a very short demo of the 2016 Hitman game was played (badly) on stage powered by Polaris 10. It was cited Hitman was running in DirectX 12 mode (unsurprsingly, given the shear amount of coverage DX12 received during the event) at a resolution of 1440P and was running at a “buttery smooth” 60FPS constant. Unfortunately, the demo didn’t have a frame rate overlay and we also weren’t given further details as to the pricing (let alone the specifications) of Polaris 10; but it was an impressive demo which left viewers wanting more (and a lot of questions answering too). I mentioned a few paragraphs ago of AMD’s vision of the immersive era – and this was touched upon several times during the night, whether it be from representatives from film and TV producers over at Fox, to Ubisoft and 3d artists touting their passions and requirements for “needing bigger guns” (this was a direct quote Fox told AMD when the latter asked what they needed). 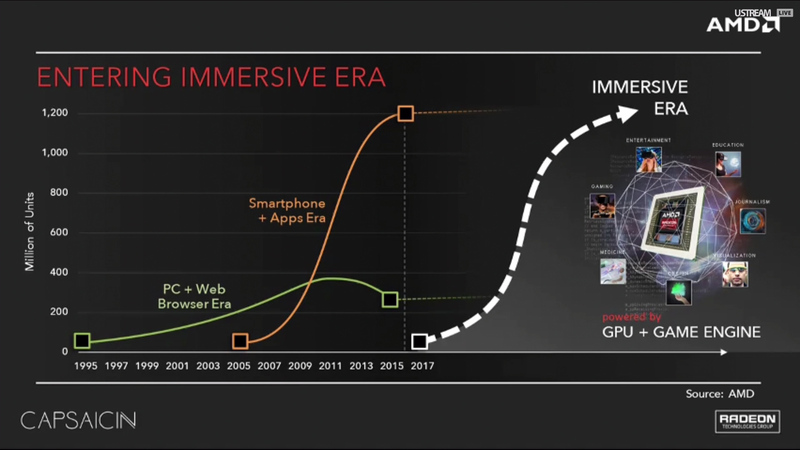 AMD believes that the “Immersive Era” will happen thanks to the usage of insanely powerful GPU’s and with game engine technology (one of the talking points from yesterday was AMD and CryTek were setting up university programs together) to bring the tools required. Game engines allow the design, rigging and animation of a virtual world, add in complex AI (if you want to interact with characters in a ‘movie’), audio and networking (imagine something like a ‘virtual’ room where you can speak with other ‘players’). 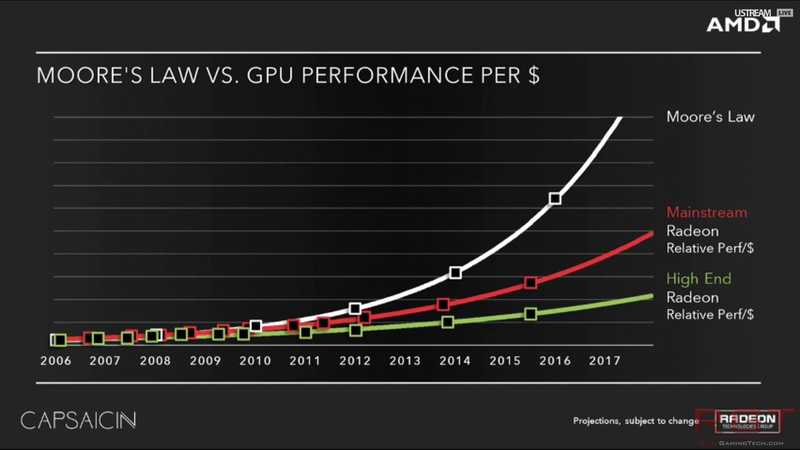 Raja Koduri stated that to truly give people “full presence” virtual reality (think being able to fully enter into a virtual world and go anywhere and not be able to tell it’s a simulation) we’d need 1 million GPU’s given their current levels of performance. During their “evolution of the pixel” slide and advances in displays, the need for ever more powerful hardware is at an all time high. It isn’t just that displays are pushing into 4K, but also at higher refresh rates. To sufficiently run a next generation VR display 1,500Mpixels/Sec are required, and 2,000Mpixels/Sec for 7680×4320 at only 60hz. It might surprise you, but it will likely only be a few years before these displays are on the market and becoming ‘normal’ with customers (look how the prices of 4K has come down over the past 12 – 18 months) and this isn’t a trend which isn’t going to change anytime soon. There’s been a lot of discussion regarding whether Virtual Reality will become mainstream, especially when the pricing of both the Oculus Rift and HTC Vive were announced. But while these early model headsets are expensive (thanks in no small part to the expensive screens they contain) prices and quality over the next year will rise. And even if VR doesn’t take off in the way the technology industry assumes it will, the progress in graphics and immersion isn’t stopping anytime soon. Better graphics, better physics, better AI, larger and more immersive game worlds eat GPU power for breakfast. This article was filed under Articles, Gaming News, Hardware, PC Gaming News, Tech News. Tagged with AMD, amd capsaicin, amd polaris, gdc, gdc 2016, gpu, moores law, polaris.